Do you often wonder how you can take better photographs? I am going to give you a few quick tips to help you take more interesting pictures. These tips will work no matter what type of camera you are using. First off, we’ll talk about the rule of thirds. Often times, you can create more interesting images when following the rule of thirds. To follow the rule of thirds, you will need to mentally divide the image into thirds horizontally and vertically. You then want to try and keep any horizontal lines in photograph (horizons, fence lines, etc.) on one of the horizontal lines that is dividing the image, and any vertical lines in the image (body, sign posts, etc.) on one of the vertical dividing lines. It is also a good idea to keep a focal point of the image at one of the line intersections. You could photograph a sunset and have the horizon on one of the horizontal lines and the setting sun at one of the intersections. In order to show you an example of the difference it can make, we can look at this picture of Luca from Elmbrook Humane Society below. It’s a cute picture, but it can be better if we follow the rule of thirds. If you look at the grid for the original picture of Luca, you will notice that his right eye is on the top line. That’s a good start for the photograph, but we could make an improvement by moving him slightly over so that his eyes are at the intersection of the top line and right line. 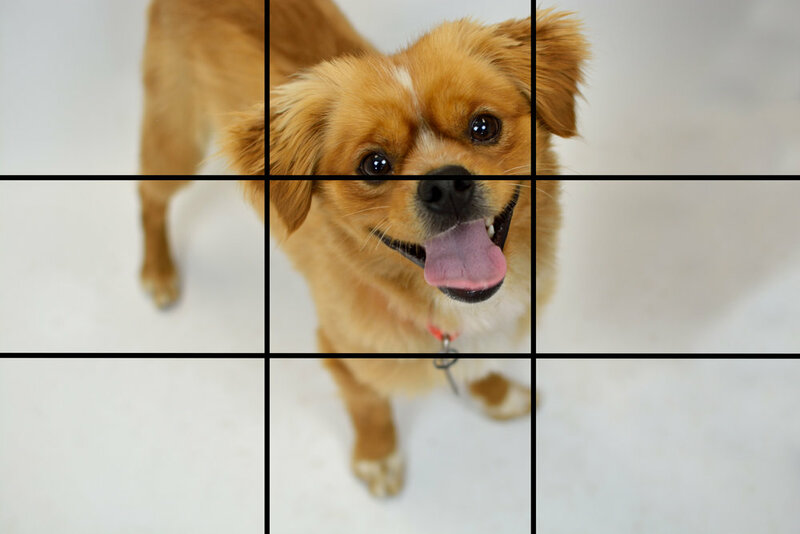 Another benefit received by moving Luca further over is the fact that his chest and front legs are now on the right vertical line following the rule of thirds as well. In this picture, the difference is slight, but there is a subtle improvement which makes the picture more pleasing to the eye. Keep in mind, this is just a suggestion, and it is not something that has to be followed in order to take a great photograph. Sometimes the image you have envisioned taking does not conform to this rule. In the end, it is your artistic choice! I encourage you to play around with the rule of thirds, and see how it changes the images you have been taking. When taking photos, soft light is generally considered better. Hard light casts unflattering shadows on your subject, and it makes it hard for them to not squint their eyes; whereas, soft light gently wraps your subject illuminating them without casting harsh shadows. You might be asking what hard light and soft light are. Hard light comes from a direct light source, such as sunlight or a bright lamp with no lampshade, and soft light comes from an indirect light source, such as shade or light coming through a curtain. If you are outside on a bright sunny day, you want to avoid taking pictures directly in the sun if possible. Try to find shade somewhere to put your subject in. You can look for trees, an awning, or a building that is casting a shadow. You can also look for a wall, a fence, or something similar to use that will have an added bonus as doubling as a cool backdrop for the picture. Check out the two pictures below to see what a difference taking a photograph using soft light can make. No, I don’t mean put your picture in a picture frame; although you can always do that! What I mean by frame your shot is to use something in the photo to frame your subject. You can get some really neat photographs by looking around for objects to use as a frame. You can use the rails on stairs to frame your subject, a hole in a fence that is missing boards, trees that are growing over a street or walkway, a window, or a doorway. The possibilities are endless! Now that you have three new tips for taking more interesting photographs, get out there and practice! The more you practice, the more natural it will become. Soon you will start doing these things without even realizing you are doing them. Please share pictures you’ve taken using these tips in the comments below. I would love to see them!